I assume a wpa_supplicant.conf on the FAT32 /boot partiton is enough to turn it back on for headless use ? Yes, if country= is set, then it should be okay. I tried yesterday to get WIFI working on this new release, but after a lot of trying I finally got it to work. I'm not sure if it is a bug or a feature, but here what I did to get it to work. I'm using the lite image, so I have to do it headless. I tried setting it in raspi-config > Localisation Options > Change Wi-fi Country. Yes, that should've probably been in the release notes. And you've just made me realise there's another issue. If you use Raspberry Pi Configuration (rc_gui) or raspi-config, rfkill unblocks wifi. If you boot and manually modify wpa_supplicant.conf, then you'll still need to run 'rfkill unblock wifi' yourself. The third scenario, which has me worried now, is what happens when you drop in wpa_supplicant.conf on boot. The service which disables wifi should run after the service which copies wpa_supplicant.conf. Right now they seem to run at roughly the same time, which may result in headless setup being more difficult. I'm looking at the WiFi icon now and it is not telling me which band I am on. I'm connected to my .ac (moved from a Pi3 to the Pi3+ with and updated card), it still connects fine without any alteration but it should tell me if I'm now on 2.4 or 5, but it has not mention of it. - When I click on it (left click) it just gives blurb about in light grey text about setting a WiFi country to enable etc. <--- this shouldn't happen, I'm sure I use to get a menu to disconnect/connect etc ? - When I right click on it it gives me the usual menu. The indicator only shows that that SSID has 5Ghz available, not necessarily that that's the one that will be used. It still just does whatever wpa_supplicant does by default when the same SSID is available on multiple channels or bands. bensimmo wrote: - When I click on it (left click) it just gives blurb about in light grey text about setting a WiFi country to enable etc. <--- this shouldn't happen, I'm sure I use to get a menu to disconnect/connect etc ? I don't follow. Why shouldn't it happen? I have it already set as I'm using WiFi (typing from it the Pi3+ now), why would I need to be told to enable it ? I'm sure I used to click on it before and be given a list of WiFi it can see and then disconnect from it and select another. Oh, interesting. What does your wpa_supplicant.conf look like? The check in the plugin might be fragile. Just checked and the plugin doesn't look at wpa_supplicant.conf, which makes sense since it may not be readable by the user. What does 'iw reg get' return? But before it had been rebooted and in fact switch from work WiFi to my WiFi as I brought it home showing the same problem, so there is a problem there, maybe others will see it. Is that saying DE aka Germany ? bensimmo wrote: Is that saying DE aka Germany ? Looks like it. No idea why. Used a clone of my initial setups (so basically the previous release image with WiFi set and a few style tweaks). Updated one that had a lot of updates to do and another than had slightly less than a lot and had been used a bit. Both have not shown the problem. Both have the same wpasupplicant, both showing the same DE in iw reg get as the one showing(ed) the problem. The one that originally showed the problem was my daily use card and had incremental updates every day or two as they came out. So maybe something along that update route caused it or sods law. Anyway if others see it, set the country in Raspberry Pi Configuration and reboot. Before you do that pop some info on here as I guess there is a gremlin somewhere. When my ISP provided me with a new router/modem as part of a (free) TiVo box upgrade I discovered that said router used the same SSID for both bands, whereas the old one had "-5G" or "-2G" appended to the main SSID string. Subsequently I discovered that the string could be changed as part of the new router's (advanced) setup so I can, again, choose which is used by any dual-band devices be it a (newish) 'phone or a P3B+. just mentioned after upgrading that "Hardware Acceleration" is now supported in Chromium on my RPi3+ - that's just something I tried to achieve before and failed ... now I'm very interested in the way they got it working. So is there any public repository for the official "chromium" package distributed by raspberrypi.org ? Or for any of the packages? I switched mine the other way, so the router does the intelligent bit it works all the magic out on load and signal strength and will move what it can to 5G if it give the faster stable connection and vice versa to 2.4G. 5G really is just as crowded as 2.4G as all the ISP routers have or had dual for a while. Especially as there are few left on DSL and most should be FTTH given it costs the same. We only have one ISP (excluding WiFi style ones) here for the whole city and outskirts. Luckily there are not many routers picked up around me. 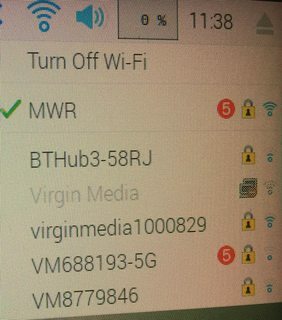 Now have nice 5G indicators on wifi scan, not sure why that Virgin Media is ghosted though ? Worked for me as well, but purely by chance. The two services run at exactly the same time, so I am not 100% convinced that the new wpa_supplicant.conf will be copied first every single time. I guess we'll know when more people get their hands on the 3 B+. mikerr's instructions for a headless start at viewtopic.php?f=66&t=207882&p=1285278#p1286649 worked for me as well. I've got one of those (image attached) but for a "BTWifi-X"; a very quick search seems to indicate that this is the SSID that BT uses for sharing connections between their users, but you need an app to use it and, *I believe* (as in, I very much might be wrong) it's secured with a certificate. But I actually came here to post about the other interesting SSID I found; a quick Google for that seems to indicate that it's someone with a blank/hidden SSID. Perhaps the LX-applet should either not show that, or flag it as a hidden SSID? Good chance it is, Virgin do the same thing, they can opt out but then they also cannot use other Virgins guest access points. at least that was the idea when it was introduced. How do i resolve these? I am also missing my usb ports in domoticz after this update. not sure why that Virgin Media is ghosted though ? As others have suggested that likely has something to do with Virgin's Public Access Point services being provided on subscriber's home routers. I recall seeing the same on my mobile phone until I opted-out of the opted-in by default service. Looking at the source code would perhaps give clues as to why it's showing but greyed-out.